It’s your daughter’s birthday and you have gotten her a store bought gift you think she will love. You excitedly hand her the gift, she opens it with wonder and immediately puts the actual gift to the side. She begins to play with the box, tissue paper, and even the instruction manual that comes in the package. What is going on? Was the gift you purchased a failure? No! This is simply an example of loose parts and the important role they play in a child’s creative and imaginative play. Loose parts include both natural and manufactured materials that can be moved, combined, and taken apart in a variety of ways. There are an abundance of natural and manufactured materials for children to play with and manipulate. Natural materials can include objects such as rocks, pine cones, pebbles, shells, sand, sticks, leaves, and seedpods. Examples of manufactured materials include blocks, rings, balls, and boxes. The diversity of these materials not only encourages creativity and imaginative play, but leads to longer and more complex play. Open-ended play supports imagination and creativity, which is the foundation of the Reggio Emilia philosophy. When children are given a chance to play with little-to-no adult interaction or direction, they are able to express themselves freely and creatively because there are no limitations or expectations. Playing with open-ended materials allow for imaginative play because of the multiple uses and numerous possibilities. Loose parts such as cardboard boxes and fabrics can encourage dramatic play where a child’s imagination can soar. Children can create forts, tents, and costumes and become whoever they want in whatever setting they want to imagine. Activities that are closed-ended, on the other hand, have a given outcome or right answer. Puzzles are examples of close-ended activities and can restrict creativity and imagination. developed during this creative process when children are trying to figure out and understand what works and what doesn’t. Since the child is choosing what materials interest them, the activities are child-centered in nature. When children play with loose parts such as blocks and leaves, they are unknowingly using math skills to count, sort, compare, and contrast these materials. Playing with sand and water teaches basic science principles because children are using their senses, making observations, and learning about the various textures and movement of these materials. There are several ways a parent or educator can incorporate loose parts into children’s play. Natural materials that are child-friendly provide for a diverse set of materials that change throughout the seasons and allow for longer and more complex play. These natural materials include cones, small stones, and leaves. There are loose parts systems that encourage interaction and cooperation among children in order to build the parts into a larger whole. Boxes, balls, rings, cones, and other manufactured parts are wonderful and readily available parts for play and can be used in a variety of settings. As a parent, it is very easy to get your child involved with loose parts play. Find items around the house such as boxes, old sheets, and buttons. 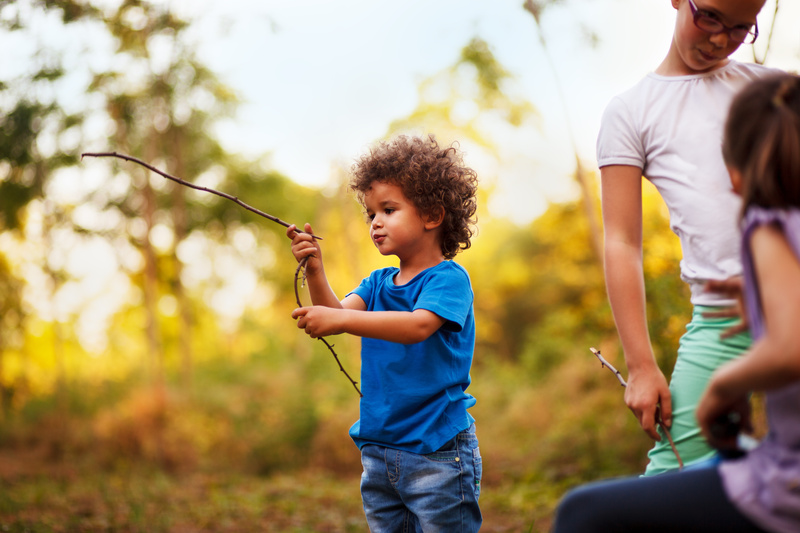 Or take a walk outside with your child and have them collect sticks, rocks, leaves, or other natural materials that might interest them. Give them a safe environment, little or no direction, and watch where their curiosity takes them! If you want to provide your child with a truly imaginative and creative experience, give them some simple loose parts and watch the magic take place. Loose parts play can occur outside in the backyard, on a walk in the neighborhood, in the kitchen, or in the classroom. The social and cognitive development attributed to this form of play is quite amazing. Who needs the newest toy or gadget when such simple everyday items can bring so much joy and learning to your child? For more information about The Compass School and how we use loose parts in the classroom click HERE! Previous Post: Who is Loris Malaguzzi? Next Post: What if Your Child Doesn’t Play?